Where's the Love for Working Fathers? Often forgotten in the conversation about the difficulty of raising children while cultivating a career is the other half of the equation: working fathers. 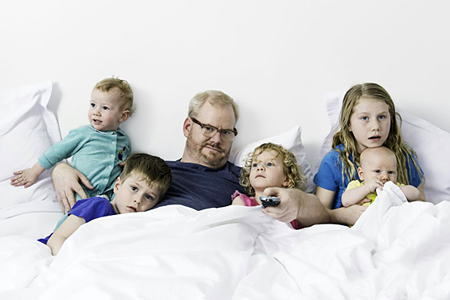 Of course, historically, since working fathers have been the primary breadwinners of American families and mothers the primary caregivers, there hasn’t been much sympathy for fathers when it comes to helping them achieve a better balance between their work and home lives. However, given that women are now increasingly becoming the primary breadwinners and men are taking a more active role in raising children, there’s been a growing emphasis in corporate America to provide better benefits for fathers as well as for mothers. 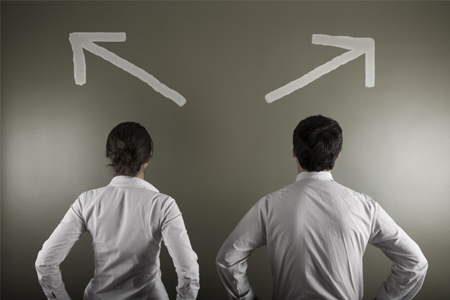 And so to find out just how much better, this past April Vault surveyed hundreds of men working in various industries (more than 80 percent of those surveyed were married or partnered men between the ages of 25 and 44). And what we found is that, on average, men are somewhat satisfied, though not terribly overjoyed, with their firms’ policies to accommodate working fathers. We also found that there’s a fair amount of disparity among industries in the quality and quantity of these policies. What follows are more of our survey's findings. 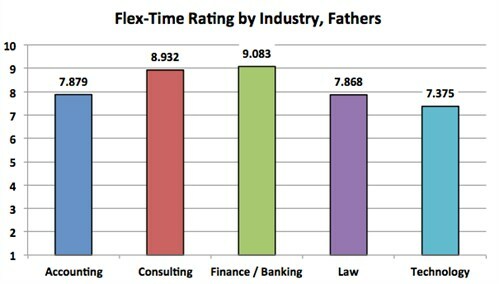 Overall, as you’ll see in the chart below, survey respondents who work in accounting rate their firms highest when it comes to how accommodating they are for working fathers (survey respondents were asked to rate their firms on a scale of 1 to 10, with 1 being not accommodating at all and 10 being extremely accommodating). This is perhaps not all that surprising since accounting firms and, in particular, the Big 4 accounting firms (PwC, Ernst & Young, Deloitte, and KPMG), are regularly singled out by publications such as Working Mother magazine for their generous benefits offered to working mothers. And since it's often believed that the way to help working mothers succeed in the workplace is to provide ways for their spouses to take on more of the caregiving responsibilities at home, it follows that these firms would also be rather accommodating to fathers. In any case, consulting was the second most accommodating industry, followed by law, finance/banking, technology, and manufacturing, respectively. Accounting also ranks on top when it comes to satisfaction with paternity leave policies (see the chart below), with law coming in second and consulting coming in third. Finance/banking, technology, and manufacturing all rate relatively much lower. Surprisingly, many firms offer lengthy paid paternity leaves. Note in the charts below that more than 30 percent of respondents tell us that their firms offer more than four weeks of paid paternity leave, and 55 percent say their firms offer more than four weeks of unpaid leave. Based on what survey respondents tell us, certain law, consulting, and accounting firms offer their male employees the longest leaves. However, it’s important to note that even among these industries, leave policies vary tremendously from firm to firm. As many working mothers and fathers know, flex-time and health insurance are perhaps even greater concerns than leave policies, since both can likely cover you for a lot longer than any leave policies can. To that end, you’ll see in the charts below that although there’s less disparity among industries in flex-time arrangements and health insurance versus paternity leave policies, there are a few interesting scores to note: (1) Finance/banking ranks very well in flexibility, with law ranking behind all but technology; (2) Technology firms lag behind all other industries in flex-time and all but manufacturing in health insurance; and (3) In health insurance, only consulting firms receive higher than an 8 rating, suggesting that professionals are at best fairly satisfied with their insurance coverages but are by no means extremely happy with them.